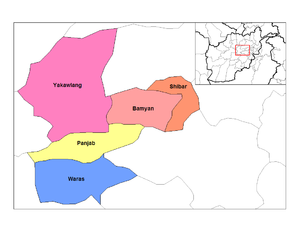 Bamyan Province (Persian: بامیان‎) is one of the thirty-four provinces of Afghanistan. It is in the centre of the country. Its capital city is also called Bamyan. Most of the people are Hazaras, with fewer Tajiks, and Pashtuns. Bamyan is the largest province in the Hazarajat region of Afghanistan. The former governor of the province is Habiba Sarabi. She is Afghanistan's first and, so far, only female governor. Bamiyan is famous for its potatoes. Bamyan Province has the only university, Bamiyan University in the area. This page was last changed on 8 September 2018, at 19:31.